Fruit Fiesta is a classic online video slot game from Microgaming that has been released in November 1999. This online video slot machine game has 3 reels and 3 pay lines. The theme of Fruit Fiesta is simply about enjoying a good ol’ 3-reel slot machine game, but it’s more exciting because it has a Progressive Jackpot up for grabs. It clearly shows that when you play this traditional 3-reel slots game, you can have the chance to hold a real Fruit Fiesta-themed party if you manage to strike it rich! Did you know that Fruit Fiesta is considered to be one of the first Progressive online casino games that Microgaming released? Even if Fruit Fiesta has been around for many years, it is still popular as it is played by hundreds to thousands of people every day. Many online slot players love playing this classic slot machine game as it brings out a genuine impression of a real land-based casino slot machine in every way. Those who love to play classic 3-reel online slots liked the overall game play of Fruit Fiesta, and the simplicity becomes even more fun with a wild symbol and an awesome Progressive Jackpot prize! Microgaming online slot games are available to players in 2 formats – download and no-download. Whether you like to download their software first or you prefer to play instantly without the need to download, then Microgaming surely has online slot machine games to accommodate your every slot gaming preference. Fruit Fiesta is a slot game that belongs to the download category, which means you must download first before you are able to play this particular slot game. Also, this particular slot game is available for Real Money Players only. The Fruit Fiesta online slot game features 3 reels and 3 pay lines, no fancy stuff to remember, a wild symbol, a maximum coin jackpot of 1,600, and a progressive jackpot which averages $23,000, and has just previously paid out more than $90,000 to a very lucky winner! Microgaming software provides state-of-the-art graphics and sounds that are considered to be absolutely outstanding. They have a great reputation of continuously making the most stunning graphics and superb sound effects. A lot of online slot players love Microgaming because its online slot games have smooth animation and astonishing yet non-intrusive background music and sound effects. Since it is essentially a no-frills type of slot game, Fruit Fiesta has been designed to look like a simple classic slot game with matching sound effects. Everything you’ll need is just in one screen. The casing includes the reels, buttons and the paytable. You will also see the current Jackpot amount on the information window in the middle right corner of the screen. The main background color of the game screen is green. The other colors used in this slot game are purple, red, orange, yellow, pink, black and white. In Fruit Fiesta, the background music and sound effects you will hear are very similar to the ones you will find in land-based casinos. Whenever you spin the reels and form winning combinations, simple sounds common in land-based traditional slot games are played out. There are no regular card deck symbols available in the Fruit Fiesta online video slot game. The regular symbols that you will find in the Fruit Fiesta slot game are the 3-Bar, 2-Bar, 1-Bar, Rainbow Seven, Purple Seven, Bell, and fruits such as the Pineapple, Plum, Orange, and Watermelon. The Wild Symbol is the Fruit Fiesta. The Fruit Fiesta wild symbol functions as a substitute for all other symbols in order to you help you form winning combinations. You are paid varying prize amounts (see payout table) when you form winning combinations with multiple Fruit Fiesta wild symbols on an enabled pay line. If you bet 3 coins (max) per spin, and you managed to get 3 Fruit Fiesta wild symbols on the 3rd pay line, you will win the Progressive Jackpot prize! There is no Scatter Symbol in the Fruit Fiesta online slot game. Since Fruit Fiesta is a traditional, old-school 3-reel slots game, there are no bonus features in this game. The Fruit Fiesta online slot game has a progressive jackpot to flamboyantly reward its loyal players! A progressive jackpot is described as a continuously-accumulating prize, and the most recent value of the Progressive Jackpot is showcased at the middle right corner of the Fruit Fiesta online slot machine game. You are only eligible to have the chance to win the Fruit Fiesta Progressive Jackpot if you wager the max bet of 3 coins per spin. If the Progressive Jackpot is enabled and you obtained 3 Fruit Fiesta wild symbols on the 3rd pay line, you will win the Fruit Fiesta Progressive Jackpot! Online slot players all over the world are notified when the Fruit Fiesta Progressive Jackpot has been won, and then it will reset to its fixed minimum value. Fruit Fiesta has 3 reels where you may bet on 3 pay lines. The betting amount is fixed at 0.25 per line. You can wager from 1 up to 3 coins per pay line. Thus, the minimum amount you can bet is 0.25 and the maximum amount you can bet is 0.75 per spin. Please take note that the amounts mentioned above are in Pounds, but they will remain the same if you choose to play in US dollars, Euros, or Canadian dollars. For every coin that you wager, you will activate a higher pay line. The Progressive Jackpot is enabled when you wager the max bet of 3 coins. The Fruit Fiesta online slot game can only be played by Real Money Account users. 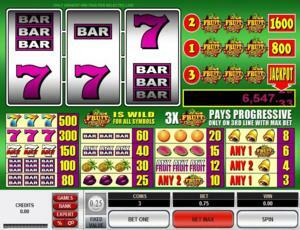 The maximum payout other than the Progressive Jackpot in the regular Fruit Fiesta online slot game is 1,600 coins. Online slot machine games are much easier and more fun to play when it has an Autoplay function. In Microgaming online slot games, they have 2 game modes – Regular mode and Expert mode. If you would like to play the Fruit Fiesta online video slot game automatically, all you need to do is access the Autoplay function by clicking on the “Expert” button located at the left corner of the game screen. In it, you will find the Autoplay setting that lets you play a desired number of consecutive spins automatically.